Our Premium Services team is available to assist with client needs that do not exactly fit the traditional fulfillment model. Our services range from adding value to a product, kitting and shrink-wrapping, assembling for retail specifications or correcting mistakes made during the manufacturing or printing process. Kit Building & Assembly - Utilize automated carton sealers, flow rack, conveyors, weight check and solid processed to kit and bundle items together in ready-to-ship sets that can be stored away for inventory or built on-demand as orders are placed. Shrink-wrapping/Bundling - Keep your products protected and looking new with our shrink-wrap services. Retail Packaging - Let our premium services team ensure your products are retail ready. Our services include kitting and assembly of raw materials, and retail ready packaging for distribution to your retailers. Ink-jetting/Tabbing/Wafer Sealing - Create mail-ready pieces by applying addresses or other information directly to the piece. Freight Scouts is the non-asset based freight brokerage division of PBD Worldwide. Freight Scouts focuses in on delivering exceptional freight solutions for clients including Truckload, Less-than-Truck (LTL) and Parcel Shipping. By leveraging PBD's nationwide network of distribution centers, Freight Scouts adds the transportation management power to an already established suite of 3PL services. Our promotional products division, PBD Promotions, was born from our clients need for the highest level of service in logistics and procurement, combined with creative services to take their products from just logoed items to an extension of their brand message. Our team has over 25 years of experience assisting companies with complex promotional needs including garment sourcing, custom imprint, points based rewards programs and traditional event-based promotional items. We offer an unlimited selection of quality products and industry-leading logistics and fulfillment capabilities. Keep control of your brand & reduce costs with our web-to-print portal. Our web-to-print portals, powered by PBD One2One, are online, eCommerce marketing centers where customers can order everything from static documents to personalized print and mail pieces and cross-media campaigns. 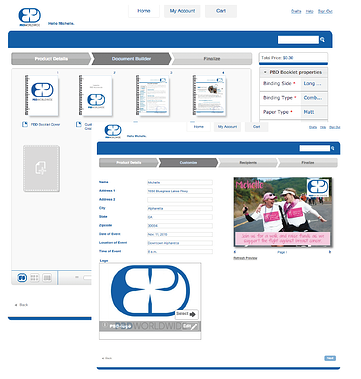 Your customers can browse, select, customize and order personalized print documents, create custom booklets with the document builder tool, select production attributes such as finishing, binding and fulfillment. What's more, PBD's full mail house enables your customers to upload recipient lists and have our team mail out items on their behalf.